An “endurance sports” company is planning a prison-escape themed triathlon, set on the grounds of the Louisiana State Penitentiary, also known as Angola, a prison where real, living people are doing real hard time, including many on death row. Participants in this endurance race will sleep in an old death row cell block, and winners will receive actual, disused prison keys. The race organizers want you to know they’re not being “disrespectful.” Oh? The Escape from Angola race is planned for March 20, put on by a company called FRESHJUNKIE Racing. They’re currently taking a world of well-deserved heat on their Facebook page for the concept of the race, mainly due to how wildly insensitive and oblivious it is to actual human suffering. Finisher Medals will be a replica key to the prison and the overall male and female winners will receive retired keys from the prison. The race also has an overnight package for those wanting to sleep on site. The overnight guests will sleep in a former cell blocks unit that, until 2006, was death row. This building is being renovated to house the new Angola Museum and is regularly used to house church groups and prison ministries who stay overnight for their service to the inmates. Part of the money from this overnight packages goes to the prison’s museum fund that will depict the history of the museum. In 2014, a friend of FRESHJUNKIE Racing, a Louisiana-based endurance sports company, and the Louisiana State Penitentiary at Angola suggested that the grounds of Angola would make for a great triathlon course since it has its own lake, is surrounded by some scenic, quiet roads perfect for biking and has a nice paved road that meanders throughout the 18,000 acres of property, making it ideal for a run. Angola began its life as a slave plantation before becoming a penitentiary around the turn of the century. It’s widely known for its prison rodeo and crafts fair, where inmates participate in bull-riding and sell handmade crafts to visitors. It’s also home to the state’s death row, where a federal appeals court ruled this summer that inmates weren’t entitled to access to air conditioning. Several death row inmates sued in 2013 after heat indices reached as high as 172 degrees in their cells. “I feel like I’m on fire,” one testified. Yes, we are holding an event at Angola. We haven’t approached the event in a disrespectful manner in any of our messaging and won’t be. That’s not what the event is about and it will not be produced in that light. It is a unique event that we are proud to host in conjunction with the prison. We are raising funds for the prison and inmate programs at the same time. Registration costs begin at $225. Update, 2:40 p.m.: FRESHJUNKIE Racing appears to have taken down their Facebook page; the Escape from Angola official webpage is still active. While the website is still up, clicking any link leads to a “404 Not Found” page. Nola.com also confirms the event has been cancelled, and quotes a Department of Corrections spokesperson expressing disappointment. Nola.com found a contract showing that race organizers would have paid the DOC “$10 per athelete and spectator and $50 per guest” who stayed overnight, meant to go to programs to help inmates upon their release. Darryl Campbell, executive management officer for the Department of Corrections, said it was disappointing the event was canceled. Some of the proceeds were set to go to offender re-entry initiatives, supporting GED testing, vocational certification and other programs meant to help inmates upon their release. According to a contract signed Feb. 23, the race’s organizers had agreed to pay the Department of Corrections $10 per athlete and per spectator, and $50 per guest who stayed in the old death row cellblock. The prison was also planning to sell food, and the contract indicated it would allow inmates to sell arts and crafts, as they do at the rodeo. Three-quarters of the inmates in Angola are serving life sentences without the possibility of parole or have been sentenced to die. 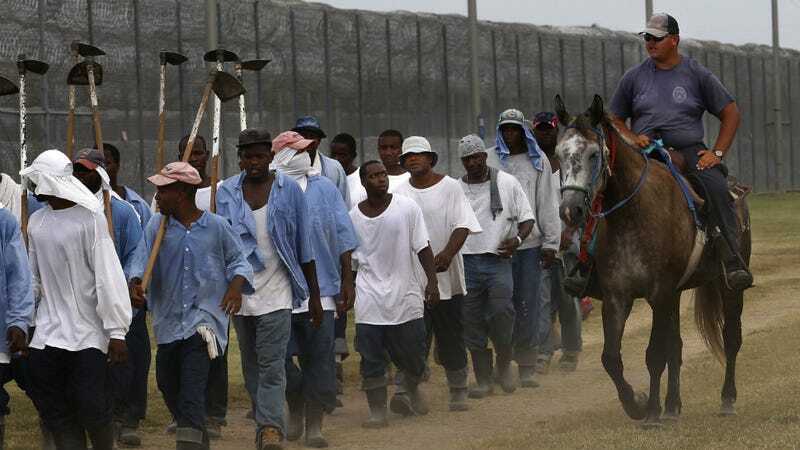 A damn shame for anyone wishing to combine their love of mass incarceration with their passion for athletics, we guess.